Core Slab M is a slab serif typeface created by Hyun-Seung Lee, Dae Hoon Hahm & Min-Joo-Ham and published by S-Core. 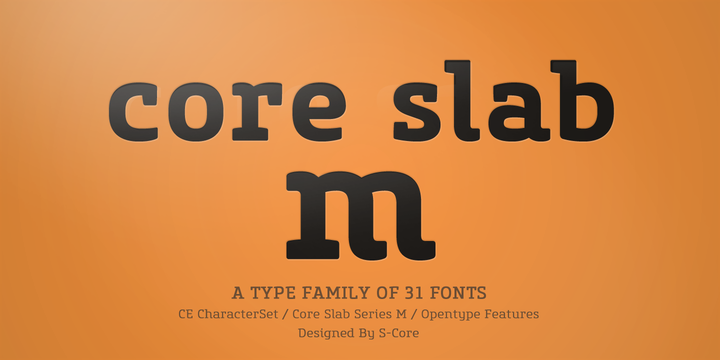 Companion to Core Sans M, Core Slab M family contains 31 fonts, 7 weights, 2 widths, Italics, Iceberg. Also it has Fractions, Numerators, Geometric shapes, Mathematic operators, Arrows etc. It is ideal for books, magazine, headline, web pages, screen display etc. A font description published on Thursday, September 26th, 2013 in Fonts, S-Core by Alexandra that has 4,109 views.